There are cases you are in sore need of a video splitter, e.g. to cut down the video file size for further storage or fast uploading; to take the annoying ads or tidbits out of the MP4 file; or to cut a specific segment of the video. Other than wasting your time finding a proper MP4 video splitter online, you will be informed of a list of top 5 MP4 splitter software. If you want to do a further step to split video, guide is also shared here. * Convert split segments to MP4 MOV MKV and even DVD pal/ntsc for burning in batch. We do the new size-up and attach great importance to users' feedback and editors' review, except for the basic MP4 editing feature, hoping you can get some clue from our top 5 software to split MP4 video files. 1. Split all kinds of videos, such as split MP4, MKV, AVI, MOV, WMV, VOB, FLV, 3GP, MTS, etc. 2. Clip audio files, like MP3, WMV, AAC, AC3, FLAC, WAV, and so forth. 3. Compress MP4 to small-sized WMV, FLV or others to cut down file size. 4. Split unlimited MP4 files and join several MP4 files into one. 5. Cut off unwanted parts of MP4 video file, e.g. annoying ads, box news, etc and only keep the desired ones. Overview: MacX Video Converter Pro features an intuitive interface, a satisfactory MP4 splitting performance, all-conquering input formats as well as other splendid privileges, making it a clear winner in the field of personalizing your MP4 video, be it splitting, cutting, joining, trimming, merging, cropping, or adding watermark or subtitles. With the MP4 video cutter, you can chop a video into small pieces and extract a specific scene for uploading to YouTube or so. Or you can cut out unwanted parts, such as ads in a video recording. Or even download MP4 video and convert and edit it for various devices, such as iPhone, iPad, Android. Overview: Avidemux is a more than a basic MP4 splitter that also provides you easy video cutting, neat filters and encoding task. Splitting MP4 files is pretty straight forward as it has a clear toolbar with frequently used buttons like Open, Save Video on the top. But sometimes you'll get error messages and the MP4 video chopper's liable to crash, leading to your hard work get down the drain. Overview: SPG Video Splitter makes the single-minded focus and does a great job in splicing and dicing MP4 files and others in AVI, WMV, etc as its name suggests. Thanks to the intuitive GUI, you can split MP4 by size or time with no hassle. Plus, it carries out less CPU usage for other tasks. However, you shall bear in mind it's loaded with limited video splitting feature. Overview: Free Video Cutter is known as a basic video splitter or clipper that has the knack for cutting large MP4, AVI, WMV, MOV, and other video files into small pieces in a pretty easy manner. Despite it's hard to manually place the sliders in precise, the clean UI and basic layout make up for this. But you shall be aware that the free MP4 splitter runs on Windows platform other than Mac OS X.
Overview: Windows Movie Maker is more than just a MP4 clipper, which lets you do all other tasks like duplicating, splitting, merging, repositioning, editing, etc. It is favorable by most video lovers, simply for its simplicity and high class user-friendliness. It shall be mentioned that Windows Movie Maker is excluded from Windows 10, but you can still download it from Microsoft site. support most video format, but not all as it is claimed on its official page. Only support Windows-based formats, like WMV, AVI, MP2, etc. Support any format/device, with 350+ output profiles infused, incl. 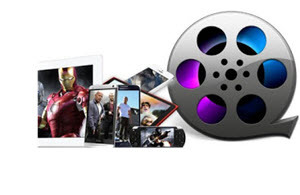 MP4, MOV, MKV, WMV, MTS, AVCHD, iPhone Xs Max/Xs/XR, iPad Pro, Samsung Galaxy S9, etc. Windows only and Windows 10 is unsupported. The 5 video editors are all good for cutting MP4 and other files, with many other features and privileges that make MP4 splitting interesting for you. But considering the massive video features, you can join the MacX Video Converter into the top 1 list. Below is the gudie on how to split and cut MP4 video on Mac/PC. 1. 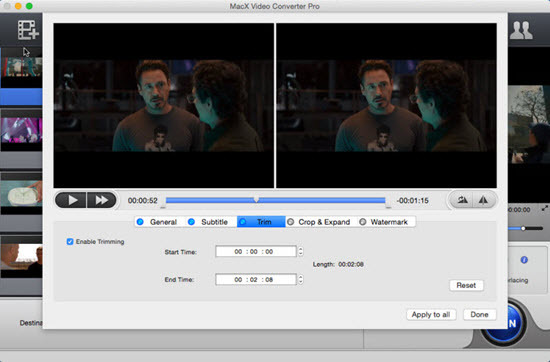 Free download and install MacX Video Converter Pro on Mac or PC following the setup wizards. 2. Drag and drop the MP4 file in the MP4 splitter. 3. Tap the "Edit" button on the main interface, after which the video editing panel pops up. ▶ Trim: Drag the left or right bar under the video preview windows or modify the "Start Time" and "End time" with values directly to get your favorite part of MP4 video. ▶ Subtitle: Select built-in subtitle tracks or add external srt subs to the split MP4 video. ▶ Watermark: Import an image watermark or create a text one to make the MP4 video personalized. 4. Tap the "Browse" button to save the output MP4 video and hit "RUN" button to tickle MP4 file splitting process. Note: it's at your disposal to set the output format as you wish. For instance, if you'd like to upload the clipped MP4 video to YouTube, you can go to the Web Video Profile. In case you want to play the diced MP4 video on iPhone, please turn to the Mobile Video Profile for your specific device. Need more tutorials about the MP4 splitter, please refer to the detailed user guide >>. MP4 plays but no sound? Never mind! This article will show you tips of fixing MP4 no sound, as well as why MP4 no sound problem occurs. Generally, an amazing video splitter can do more for you, letting you split MP4 video, MKV, AVI, AVCHD, MOV, FLV, etc. with original quality and high resolution so that you can stream, transfer or save one or some video clips to mobile device, micro SD card, USB flash drive, hard drive, etc.